See India’s pulsating capital city, New Delhi, the beautiful Taj Mahal and Rajasthan’s pink city of Jaipur. Catch a glimpse of the tigers of Ranthambhore and enjoy a camel-cart ride on the edges of Sariska National Park. Cross into timeless Nepal and see its populous capital Kathmandu and idyllic Pokhara in the foothills of the Himalayas. Arrive in Delhi, meet your Tour Manager and transfer to your hotel for lunch. This afternoon a guided tour of the Old City will introduce you to Jama Masjid Mosque and Raj Ghat, Gandhi’s cremation site. You’ll also see the Red Fort and take a rickshaw ride through the narrow lanes of Chandni Chowk. Before evening falls you’ll see some of the city’s Imperial highlights including the India Gate war memorial, the vast boulevard of the Rajpath and Parliament House. Explore the ruins of the Quwwat-ul-Islam mosque and the ornate Qutb Minar tower, this morning. 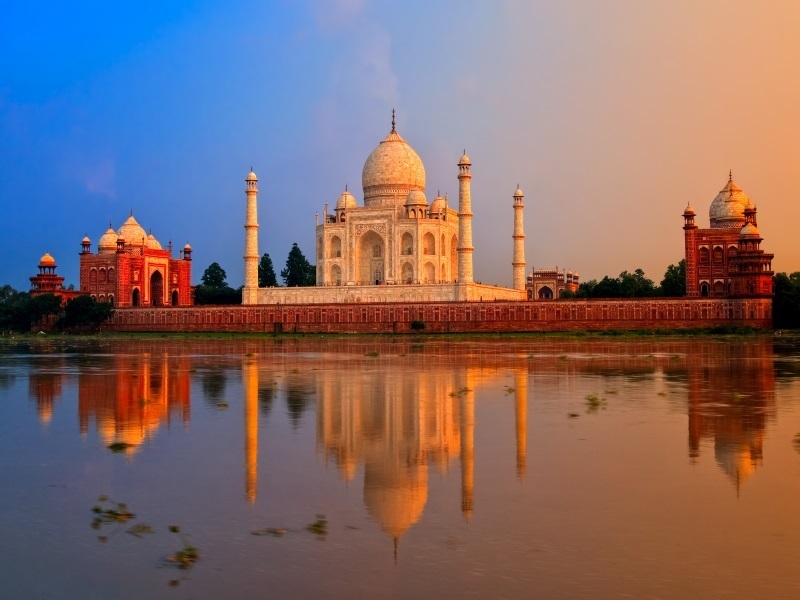 Later we’ll plot a course for Agra, India’s City of Love and site of the exquisite Taj Mahal. Built as a monument to undying love by grief-stricken Shah Jahan, after the death of his beloved wife, the Taj is seen in all its glory at sunset. Your guided tour of Agra will also take in the royal pavilions, palaces and courtyards of majestic Agra Fort. Today you’ll visit Abhaneri, a small town famed for its amazing baoris (stepwells) and the mighty Harshat Mata Temple. Discover the architectural beauty of the Chand Baoli stepwell and its intricate carved panels. Leaving Abhaneri you’ll travel to Ranthambhore National Park, one of the prime examples of Indian conservation and your base for two nights. Once the hunting ground of Indian princes, this national park stands atop a 600-metre-high hill range and plays host to a number of India’s elusive and endangered tigers. After lunch, relax for the afternoon or take an optional visit to nearby Ranthambhore Fort. In the evening enjoy the ‘tiger talk’ with a local naturalist, in preparation for tomorrow’s adventure. This morning you’ll enjoy the first of two guided tours in search of some of the park’s most revered inhabitants; striped hyenas, sambar deer, sloth bears and of course tigers (and maybe even a leopard). After lunch there will be another chance to see these and many other incredible creatures at close quarters, on your second guided tour into the park. Today you’ll travel through Rajasthan to Jaipur, India’s pink city, for a two-night stay. Settle into your heritage hotel in downtown Jaipur, and enjoy the on-site facilities, including a cooling outdoor pool. This afternoon enjoy an included sightseeing tour of Jaipur, introducing the Palace of the Winds, the City Palace and the amazing astronomical observatory built by the city’s founder Jai Singh II. Dinner tonight is with a local family in Jaipur. This morning you’ll head north to Vanaashrya. En route you’ll make a stop at the atmospheric ruined fort of Bhangarh, dating from the 17th Century, where you’ll enjoy a welcome tea or coffee. After a relaxing afternoon, hop onto a camel cart and visit the local village before a pre-dinner cookery demonstration with the chef. You’ll spend the night in your private, air-conditioned, tent designed to give a sense of the India of the past. En route back to Delhi, for your final night’s stay in India, we’ll make a stop at the intriguing Heritage Transport Museum, which showcases the development of road, rail and air in India. This morning you’ll transfer to the airport for the short flight to Kathmandu in Nepal. On arrival your local guide and coach will be waiting to to take you to your hotel for the first of two nights in the Nepalese capital. Dinner this evening will be at at the legendary Rum Doodle restaurant in the company of a Sherpa or Everest summiteer who will answer all of your questions about the world’s ultimate climb. Today you’ll enjoy an included guided sightseeing tour of ancient Kathmandu, a colourful, bustling and intoxicating city set amid the green foothills of the majestic Himalayas. Highlights include the UNESCO-listed Old City and the temples and pagodas of Durbar Square. You’ll also take a walking tour through the royal city of Patan and visit Boudhanath, one of the largest Buddhist stupas in world. Leaving Kathmandu, today, you’ll journey through the Himalayan foothills to slow-paced Pokhara. The city sits on the shores of Lake Phewa and boasts views of the snow-capped Annapurna range and triangular Fishtail Mountain. Enjoy a relaxing evening in preparation for an early start. Wake before dawn to drive a short way to Sarangkot Hill. Climb to the viewing platform, approximately 45 minutes up an at times steep but safe walk from which the breathtaking panorama of the world’s highest mountain range unfolds with the rise of the sun. You’ll return to the hotel for breakfast before a fascinating day of visits to beautiful Davis Falls, the Tibetan Refugee Camp and the Gurkha Memorial Museum, as well as a cruise on Lake Phewa. This morning your coach will take you west to Chitwan National Park and the Jungle Villa resort, your home for two nights, close to the park’s headquarters. Enjoy lunch on arrival, before an afternoon ox-cart ride to a local Tharu village – an indigenous population with unique culture. Rise early this morning to join a guide for a canoe trip up the Rapti River, home to gharial and marsh mugger crocodiles, and rare bird species. After a visit to the Crocodile Breeding Centre return to the hotel for breakfast, followed by an exciting elephant safari, hoping to sight one-horned rhinoceros, elephants, sloth bears, wild boar and – for the very fortunate – Bengal tigers. This evening enjoy a traditional tribal dance show. Returning to Kathmandu, you’ll spend a last evening in the Nepalese capital and enjoy your final dinner at a traditional restaurant with a cultural dance show.